Saying “no” to negative influences and “yes” to spiritual experiences. Seventeen year old Vijay Sharma kills his mother and steals a few thousand rupees. It sounds like a plot of the film Vastav, but in actual fact it did happen in Mumbai a few years ago. I thought this was a freak incident, but a recent conversation with sixteen year old Jaimit helped me see that cinema’s negative influence on young people is pervasive. 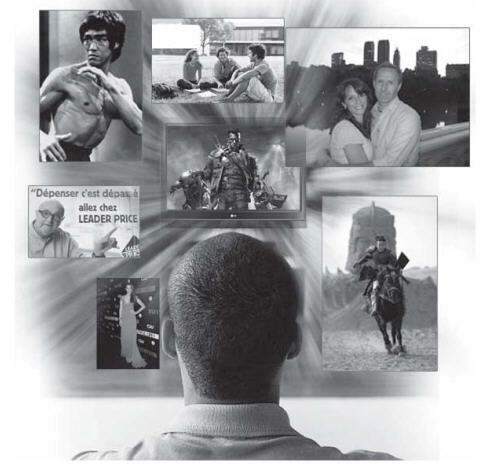 Repeated exposure to graphic and highly impactful visual images including pornographic and vivid scenes of bloodshed and violence degrades the consciousness. Besides, the flicks portray happy people as those living in mansions, reveling in passionate lust, driving expensive cars, and flaunting attractive gadgets. Even the older ones aren’t spared the bewitching influences. A simple, middle class Indian seeks a higher standard of happiness, being influenced by the wealthy and successful, as portrayed on screen. He then huffs and puffs for the elusive carrot of success, even though the smiling faces on screen have a different story to tell off screen. The few shows that do portray the horrors of this world the reality of disease and death are swamped by hordes of attractive advertisements, each promoting a product that promises unique enjoyment to our senses. As reel life throws up promises, real life pulls them down in utter contempt to our hopes and in stark contrast to the assurances. Life often throws up unpleasant experiences and unexpected challenges. To face these hardships we need a sober and peaceful mind. Repeated viewing of shows displaying explicit and hysterical passion consumes the consciousness of the audience, and makes one susceptible to emotional outbursts, even at minor provocations. One thus loses the equanimity needed to address personal adversities. The resultant frustrations take a heavy toll on the mental health, especially of the young who are yet unprepared to handle difficult and complex human relationships. I remember growing up in a south Indian temple town during the first ten years of my life with no exposure to television or movies. Our lives centered on daily visits to the temple, partaking prasada, hearing discourses, celebrating festivals, and watching devotional dramas. Later during my teens I came to the city and my consciousness was bombarded with violence and passion eulogized on the screen. It was frustrating as my hopes of seeking happiness by toeing the social line always betrayed me. Years later, when I finally entered an ISKCON temple for the first time, I felt my childhood revisited. The purity illuminating on the devotees’ faces, a refreshing spiritual ambience, and a general festive mood in the temple filled my heart with the same devotion and innocence that was an integral part of my childhood. I had been seeking this spiritual experience all these years in the city without being able to recognize the need. The contrasts in enjoyment championed by the media viz a viz the spiritual experience of Krishna consciousness became obvious to me. During this first visit, as I experienced the calm of the temple, I started thinking of what it was about the temple that made me feel so good. Then it dawned on me that glamor shows only titillate the senses and provide temporary relief whereas spiritual activity fills the heart with love, kindness and a desire to serve. Loving remembrance of God and service centered relationships with everyone, the children of God, fills the heart with a spiritual experience that no offering from the entertainment industry can match. Spiritual exchanges with other devotees of Krishna chanting and dancing together to the holy names of Krishna; feasting on Krishna prasada, sanctified food offered to Krishna; and discussing spiritual subjects offer a happy alternative. This not only allows us to explore our dormant, personal relationship with God but also soothes the mind during troubled times. A large number of devotees in ISKCON, practicing spiritual life over three decades, have no regrets of giving up the world of cinema and television as their source of entertainment. Opening ourselves up to spiritual influences not only leads to no unwarranted violent reactions from us, but empowers us to respond maturely even when life treats us violently. The Vedic scriptures reveal the history of Narada who was born as the son of a poor maid servant. He assisted his widowed mother in her service to Krishna’s pure devotees. His entertainment was hearing about Lord Krishna from the visiting devotees. The attraction to Krishna grew in his tender heart and when his mother died unexpectedly due to a snake bite, the orphaned five year old Narada was undaunted in his search of God, and attained a stage of supreme spiritual bliss in devotion to God. Emperor Parikshit who ruled the planet 5000 years ago also led a life centered on loving Krishna. The impressions of his God centered childhood were permanently etched in his consciousness. This foundation helped him rule the kingdom with courage and wisdom. Later as tragedy struck the king with a death notice, he relinquished his unrivalled wealth and prosperity without hesitation, and went to the bank of the Ganges to absorb himself in hearing about Krishna. He then attained the supreme human destination returning back to the spiritual world. Both Narada and Parikshit displayed level headedness and maturity beyond compare; they converted material adversity into a spiritual success. The secret of their success was in cultivating a relationship with Krishna and attachment to Krishna’s devotees. While gross lust and violence are easy to represent through visual effects, the television medium has an inherent deficiency in depicting inner strife and the consequent emotions churned in the heart. The spiritual journey and internal struggles of great personalities are taught extensively in holy scriptures. Hearing and discussing these examples in the association of sincere spiritual seekers leads to deep contemplation, honest introspection and active internalization of the timeless spiritual truths. Then, as the inevitable miseries of this world attack, a devotee following the footsteps of Parikshit and Narada is prepared to face them and grow in his/her spiritual experience. Srila Prabhupada compared allowing God centered vibrations to influence our consciousness with cleansing of a room. An intelligent person would gladly agree to get his room cleansed of all the garbage. Similarly Krishna conscious vibrations singing, dancing, feasting, and spiritual discourses help us make our mind pure. The intelligence sharpened by studying the scriptures and chanting of the holy names of the Lord enables a practitioner to recognize the factors influencing him/her negatively, rather than get carried away by them. A spiritual lifestyle also helps a practitioner pursue his career and material responsibilities with confidence and dignity. Ananda Vrindavana Dasa, a 45 year old businessman working in Bombay Stock Exchange (BSE) has often been materially challenged by the fluctuating market conditions. However, for the last two decades he travels a long distance daily to the temple and chants and hears spiritual topics in the association of devotees. He has never compromised his spiritual standards and is focused and composed at all times, while his colleagues at the office struggle with swinging moods and intense business pressure. Ananda Vrindavana Dasa is clear about his priorities; the goal of human life is to prepare our journey back home, back to Godhead and perform our material duties as a service to God. I can’t help contrasting his example with the hundreds of people I see daily travelling in Mumbai’s trains, most of whom appear stressed at all times. Irate train commuters quarrelling over a seat, honking taxi drivers hurling expletives at rushing pedestrians, or the angry hawkers and annoyed buyers is all a common sight in the cinema crazy city of Mumbai. The choice of being influenced either by the media or by a spiritual culture and the resultant rewards are entirely ours. A spiritual path gives us tangible benefits the strength to face trials, a more nourishing entertainment, and the clarity to pursue worldly responsibilities. Besides, the ultimate goal of life to reawaken our dormant love for God, and go back to our real home, back to Godhead is guaranteed to a sincere spiritual practitioner. My thoughts go back to Jaimit; if he were a practicing spiritualist, he could certainly deal with his natural adolescent attractions more maturely.